President Barack Obama's half brother has broken his media silence to discuss his new novel — the semi-autobiographical story of an abusive parent patterned on their late father, the mostly absent figure Obama wrote about in his own memoir. 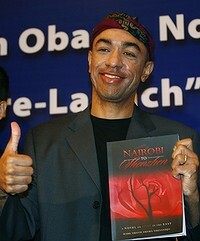 In his first interview, Mark Ndesandjo told The Associated Press that he wrote "Nairobi to Shenzhen" in part to raise awareness of domestic violence. "My father beat my mother and my father beat me, and you don't do that," said Ndesandjo, whose mother, Ruth Nidesand, was Barack Obama Sr.'s third wife. "It's something which I think affected me for a long time, and it's something that I've just recently come to terms with." Like his novel's main character, Ndesandjo had an American mother who is Jewish and who divorced his Kenyan father. The novel, which goes on sale Wednesday by the self-publishing company Aventine Press, is one of several books in the works by relatives of the president. President Obama's parents separated two years after he was born in Hawaii in 1961. The senior Obama, a Kenyan exchange student, divorced the president's mother, Stanley Ann Dunham, in 1964 and had at least six other children in his native Kenya. For the past seven years, Ndesandjo has been living in the booming southern Chinese city of Shenzhen, near Hong Kong, and has refused all interview requests until now.